However, Both Lewis and Tolkien seem to be critical of this idea of the inexorable upward evolution of mankind. Instead, they appear to believe in a general winding down of history; a slow movement away from bliss to destruction. In this paper, I will compare their writings in a few major areas. First, I will look at how they describe the overall pristine nature of the world in their creation myths. Then I will examine the belief that their characters have in a better or more glorious past or the distrust of progress away from the past that exists in their stories. I will next examine how the idea of the general winding down of history is presented in their works dealing with eschatology. Finally, I will show that even though the means will not be human progress, there is a final hope offered by both authors. The intentionally Edenic description of the planet Perelandra takes the better part of several chapters to unfold. The clearest way to show its pristine nature is to examine the passage where death first enters the world. Ransom comes across a frog that has been mutilated by Weston, the un-man. “On earth it would have been merely a nasty sight, but up to this moment Ransom had as yet seen nothing dead or spoiled in Perelandra, and it was like a blow in the face.” Lewis continues a few sentences later. “The thing was an intolerable obscenity which afflicted him with shame. It would have been better, or so he thought at that moment, for the whole universe never to have existed than for this one thing to have happened.” The beauty and unsullied nature of Perelandra was so overpowering that the mutilation of this small creature is beyond comprehension to Ransom. In these three examples the created world is described as a place of bliss and a place of wonder. Their sub-created worlds were nearly perfect at the beginning. There was no need in these worlds for progressive humanity to come and mechanize it to greatness. Technology, science, and social reform was not going to cause any improvement in the human condition in these worlds. The progression was not upward to a golden age. Indeed, from their creation the general direction of these worlds was downward. This downward movement is also evidenced by the characters in the stories longing for a more glorious past, or if not explicitly longing for the past, treating those who came before with honor and respect and viewing them as higher. Elrond speaks to this more glorious past and laments the current state of affairs when he recounts a brief history of Middle-earth in the Council of Elrond. Speaking of the glories of the past he states “Never again shall there be any such league of Elves and Men; for Men multiply and the Firstborn decrease, and the two kindreds are estranged. And ever since that day the race of Númenor has decayed, and the span of their years has lessened.” Elrond speaks of decay and of his belief that things will never reach the former glory of the past. He adds emphasis to this point by continuing “But in the wearing of the swift years of Middle-earth the line of Meneldil son of Anárion failed, and the Tree withered, and the blood of the Númenorians became mingled with that of lesser men.” Elrond uses words that add to his theme of decay; wearing down, withering, and blood lines being watered down. The sorrow of the Elves is present in his speech. Later in the story Faramir expresses this sentiment in several ways while sharing stories with Sam and Frodo. “Yet even so it was Gondor that brought about its own decay, falling by degrees into dotage, and thinking that the Enemy was asleep, who was only banished not destroyed.” Like Elrond, Faramir uses the language of decay to talk about what happens to humans over time. He speaks of the High Men of the West and laments that his people had become “Middle Men, of the twilight, but with memory of other things.” The people of Gondor no longer have the same position of the people of old. Faramir makes this point by showing how the High have fallen to the Middle, and that they are in the twilight. This exchange is more evidence that Tolkien’s characters believed the general flow of history to be a downward progression. Completely absent in the mind of Faramir is the myth of progress. He had a sober understanding that the flow of history was one ending in nightfall, and he believed them to be in the twilight of that day already. The characters in the world of Narnia have a similar respect for history. There is a reverence in the tone used by the unicorn, Jewel, to describe the peaceful years of Narnia was reverent. Both Jewel and Tirian have a regard for those who came before and the rule of the High Kings and Queens of Narnia. Tirian maintained such respect that he called out to Aslan for their help in his time of need. In addition to the reverence for the high past that exists in Narnian leadership, there is also a distrust of the concept of progress on the part of King Caspian; particularly that type of progress which utilizes charts and graphs and pretends to be for the economic good or what is referred to as development. “’But that would be putting the clock back,’ gasped the Governor. ‘Have you no idea of progress, of development?’ ‘I have seen both in an egg,’ said Caspian. ‘We call it Going bad in Narnia. This trade must stop.’” Lewis uses to character of Caspian to lay bare the essence of those who claim progress and development are the ultimate ends. The governor was under the mistaken impression that progress and economic development was the chief purpose of managing the island. Caspian cuts through all the pretenses and calls it what it is – going bad. Perhaps nowhere in their fiction to Lewis and Tolkien refute the myth of progress than in their sub-creation’s passages dealing with death and eschatology. Much can be learned from Appendix A of The Lord of the Rings. After Aragorn laid down in the House of the Kings, we read this description of his visage. “And long there he lay, an image of the splendor of the Kings of Men in glory undimmed before the breaking of the world.” One of the simple implications of this passage is that the world will be broken. This is easy to pass over, but I believe it is important. It shows that the progression of Middle-earth is toward brokenness. This is a movement away from the initial bliss of Arda; more evidence that Tolkien did not believe in the general upward progressions of humanity toward a utopian ideal. The use of language in the passage describing the passing of Arwen also casts a forlorn shadow. “But Arwen went forth from the House, and the light of her eyes was quenched, and it seemed to her people that she had become cold and grey as nightfall in winter that comes without a star. Then she said farewell to Eldarion, and to her daughters and to all whom she had loved; and she went out from the city of Minas Tirith and passed away to the land of Lórien, and dwelt there alone under the fading trees until winter came. Galadriel had passed away and Celeborn also was gone, and the land was silent.” The language is evocative and melancholy. Light is quenched, the nightfall is cold and grey, she was alone. Both Galadriel and Celeborn were gone, and the land was silent. Again, the language used here by Tolkien is showing a winding down; a move from the greater to the lesser. This transition is even more stark in Lewis’s depiction of night falling in Narnia in The Last Battle. The entire tone of the book is much darker than any of the other Narnia adventures. The people in Narnia have largely forgotten Aslan’s true nature, and are fooled by a donkey in a dead lion’s skin. The fall of Narnia is clearly stated in the words of Farsight the eagle. Not only was Narnia finished as a political entity at this point, the words of Roonwit imply that the world itself was drawing to an end. That is certainly the feeling cast by the whole book. The ending is more explicit a few chapters later in “Night Falls on Narnia.” The un-creation in many ways mirrors the creation of Narnia witnessed in The Magician’s Nephew. It was the musical song of Aslan that was the efficient cause of the creation of Narnia. It is the haunting sound of Father Time’s trumped that set into motion the un-creation. “Then the great giant raised a horn to his mouth. They could see this by the change of the black shape he made against the stars. After that – quite a bit later, because sound travels so slowly – they heard the sound of the horn: high and terrible, yet of a strange deadly beauty.” The first thing to be created in Narnia was the stars. “One moment there had been nothing but darkness; next moment a thousand, thousand points of light leaped out – single stars, constellations, and planets, brighter and bigger than any in our world.” The stars are the first thing to be called home in the un-creation. “With a thrill of wonder (and there was some terror in it too) they all suddenly realized what was happening. The spreading blackness was not a could at all: it was simply emptiness. The black part of the sky was the part in which there were no stars left. All of the stars were falling: Aslan had called them home.” In primordial Narnia there had been nothingness in the sky and then suddenly Aslan called the stars into being. At the end, the nothingness begins to return, for Aslan had called them back. Aslan had created the talking beasts at the beginning and left them with a warning that they could one day return to being dumb animals. We see this warning come to fruition at the end of Narnia. “You could see that they suddenly ceased to be Talking Beasts. They were just ordinary animals.” Narnia was clothed with vegetation by Aslan’s song at the creation, and at the end it was made naked as the Dragons and Giant Lizards tore up the trees and returned Narnia to barren rock. This was a world that was destined to end. Father Time had been sleeping, waiting to fulfill that very purpose. The end of the world makes clear that Lewis did not intend to tell a story of the triumph of modern man over nature. These stories blatantly refute the myth of progress. They instead clearly show the winding down of time. In Arda, it is done through forlorn imagery of a cold winter evening, and in Narnia it is an explicit winding down of history and an un-creation that mirrored the creation itself. 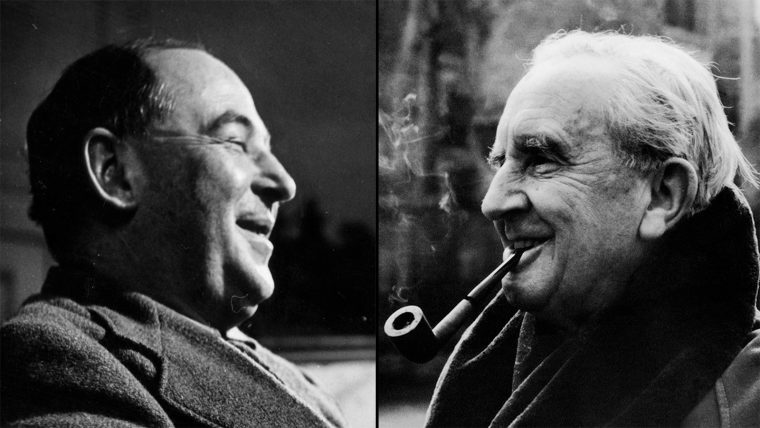 Considering their rejection of the myth of progress, are Tolkien and Lewis fatalists? Do they leave their readers without hope for the future? Not at all. In fact, the vision they present to the reader far surpasses any pseudo-utopia that humanity could ever devise. In the conversation between Finrod and Andreth, Finrod comes to the realization that they have reason to hope that Arda would be healed. “For that Arda Healed shall not be Arda unmarred, but a third thing and a greater; and yet the same.” Finrod realizes that the Valar had not heard the end of the music of Eru. Andreth shares the hope of old with Finrod. “’They say,’ answered Andreth: ‘they say that the One will himself enter into Arda, and heal Men and all the Marring from the beginning to the end.’” Tolkien is speaking here of the incarnation of Christ, who will make all things new. This is, in my opinion, the most clear vision of the Christian gospel that Tolkien put into his fiction. God, or Eru, will enter Arda and make all things new. Note the similarities between the passage presented in Athrabeth and the Biblical account of the New Heaven and the New Earth. First from the Athrabeth: “And then suddenly I beheld as a vision Arda Remade; and there the Eldar completed but not ended could abide in the present for ever, and there walk, maybe, with the Children of Men, their deliverers, and sing to them such songs as, even in the Bliss beyond bliss, should make the green valleys ring and the everlasting mountain-tops to throb like harps.” Compare to the Biblical account from Revelation 21. “Then I saw a new heaven and a new earth, for the first heaven and the first earth had passed away, and the sea was no more. And I saw the holy city, new Jerusalem, coming down out of heaven from God, prepared as a bride adorned for her husband. And I heard a loud voice from the throne saying, ‘Behold, the dwelling place of God is with man. He will dwell with them, and they will be his people, and God himself will be with them as their God. He will wipe away every tear from their eyes, and death shall be no more, neither shall there be mourning, nor crying, nor pain anymore, for the former things have passed away.’” In Tolkien’s legendarium, as in the Christian religion, God himself will come into the world and heal all the hurts. This is not the result of the progress of man. It is the work of God himself. Edwards, Mike. Doubt. Jesus Jones. SBK Records. CD. 1990. “Donald Trump’s Presidential Announcement Speech.” Time. Accessed March 28, 2017. http://time.com/3923128/donald-trump-announcement-speech/.